After a quick bite to eat (Mom had the best salmon taco ever! ), Mr. N, our Moms and little ol’ me, were ready to hit the beach! Cannon Beach, on the northern coast of Oregon, is home to several lava-created monoliths called haystack rocks. 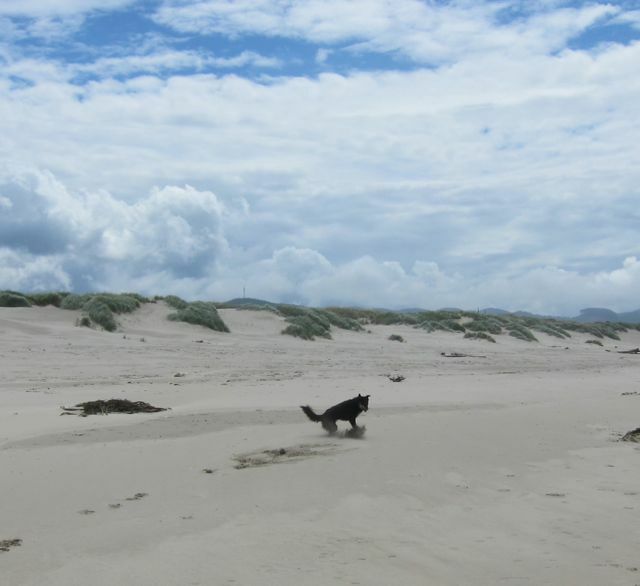 And there’s a long stretch of beach that’s very walk-able. We stopped at Haystack Rock–there’s always something to find hanging on the rocks in the tidal pools. Or just enjoying the view. 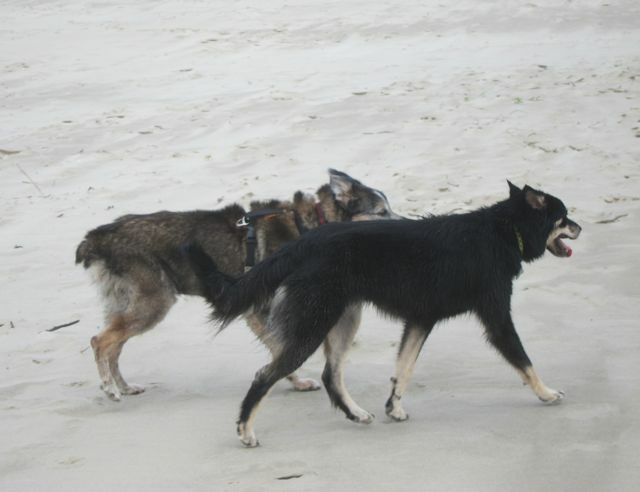 A bit further down the beach, we came to another ‘intertidal’ rock where I needed a cool down! Then it happened. A flock of shorebirds took off. And so did I. The chase was on. They flew just above the sand and twisted and turned across the beach. I was right behind. All of a sudden, I looked up and realized how far I’d gone. I think I hear Mom calling. 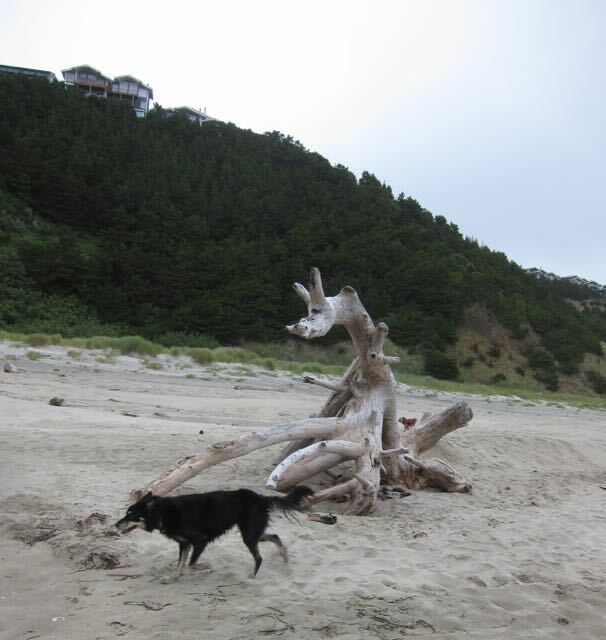 (See Haystack back there? That’s how far I chased those birds) After a short rest, we sloggered on until we reached Hug Point, 5.2 miles from where we started. It was hard to believe this was once a ‘road’ that connected Cannon Beach to another point further south! We found some sea anemones in the tidal pools below these rocks. They weren’t as dramatic as some we’ve seen, but not bad! As we headed back, I thought it was a very good day. Mom’s been a bit under the weather, so to speak, so we haven’t been around to visit everyone. But we’re baaaaaack! 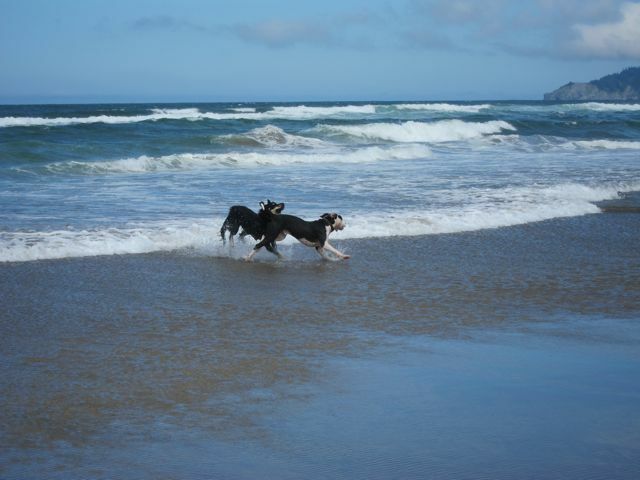 I decided to dig a bit in the sand, and Toby and Heidi thought they’d ‘help’. Actually, I think they just wanted to play ‘bury Sage in the sand’. She’s pretty spry for a Saint! But, NO ONE can catch me! On the way home, I did something I NEVER do. I crawled up into the front seat (no, Mom wasn’t driving) and let Mom and her friend know how happy I was to have such a perfect day. 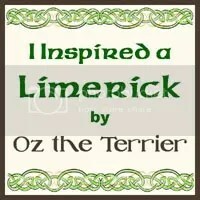 Then I crawled back with my pack and went to sleep. I’m not too sure why hu-mans put their heads on these fluffy things they call pillows, but Mom and Dad do it every night. I often go in and pull down the covers for them, but last night, I wanted to try this pillow thing out. I think you’re suppose to pull it down and make a nest for your head. At least that’s what I did. 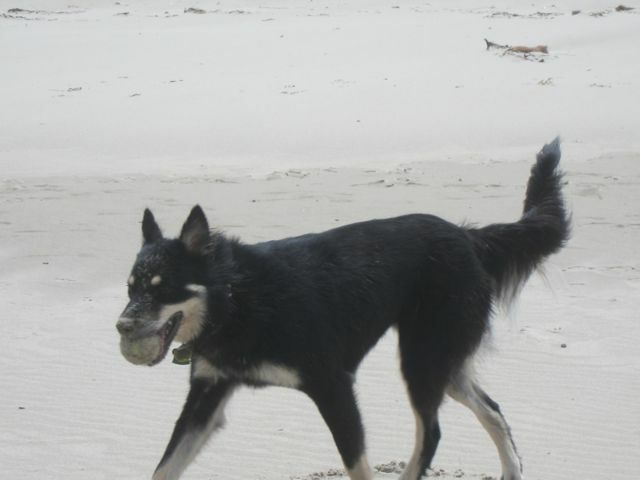 I had my favorite ball with me and all of a sudden, I started dreaming of a day at the beach. 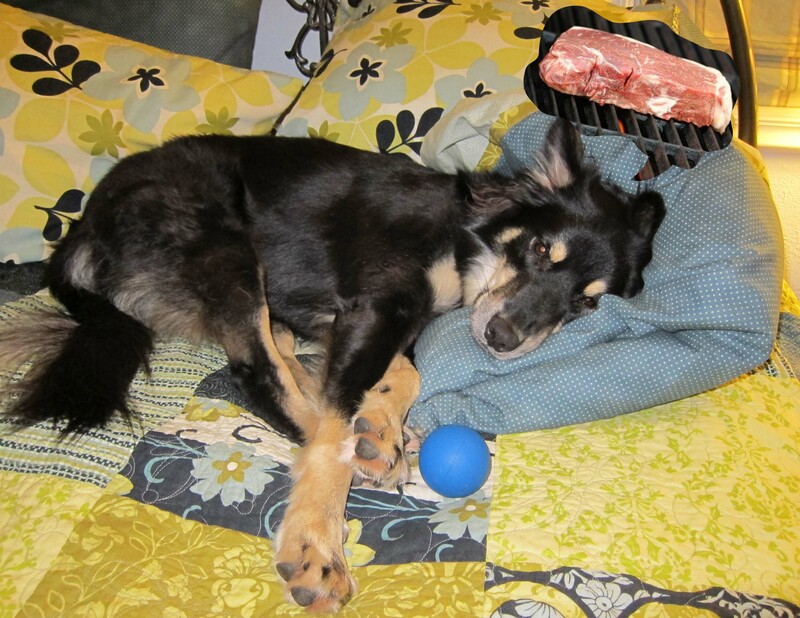 Now that was pretty awesome–maybe this pillow is magic! Then, somewhere back in the nether-reaches of my mind, I remembered the guys over at 24 Paws of Love wondering whether I ever dreamed about steaks. Are you kiddin’? I was about to slobber all over Mom’s pillow. Not sure how much of this beauty sleep I can take, but I heard Mom talking about 1000 Acres. Do you think dreams come true?? 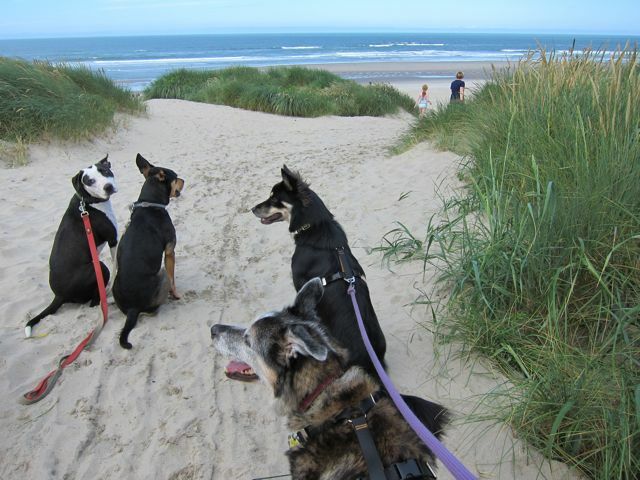 We went to the beach earlier this week, but I bet you knew that. 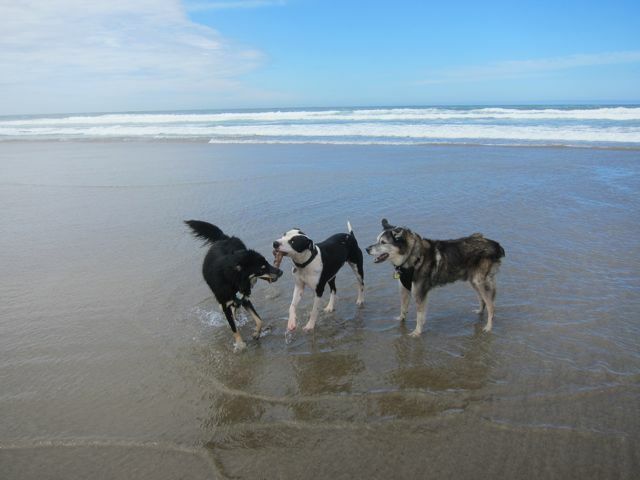 My friends Caly & Tucker were camping nearby so we went for a fun play-date. I was all set for a big run after that long car ride. Hey, guys. Are you ready? Ready, Set, GOOOOOOOO Tucker & I did a little wave action. 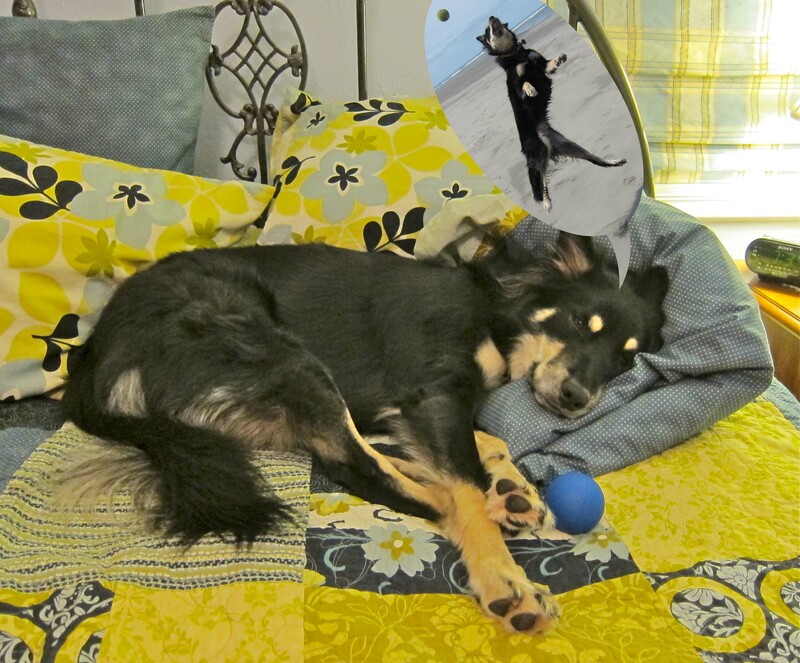 Mom says I should learn to body-surf, but a stick or ball is a lot better, I think. Even Toby, who really doesn’t like water, was getting into the action! 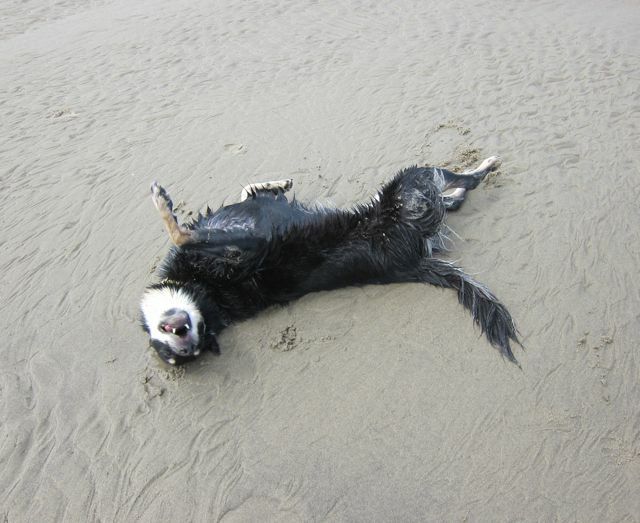 Of course, there’s always a little roll in the sand to perk you up. 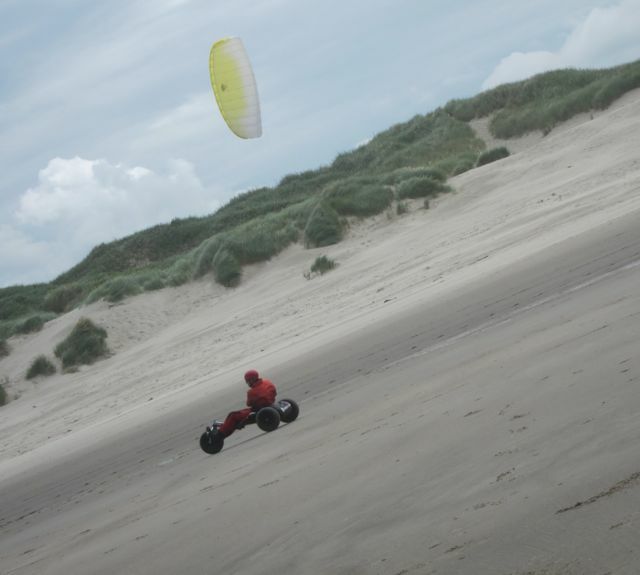 We saw this guy on a 3-wheeled beach buggy doing some wind-surfing. I thought I’d pass on that sport… I prefer balls, thank you very much. You get a little sandy when you come to a screeching halt! But a good shake later, it was all gone. What’s that, Mom? The car was full of sand after we got home? I wonder where that came from? It must have been Toby. 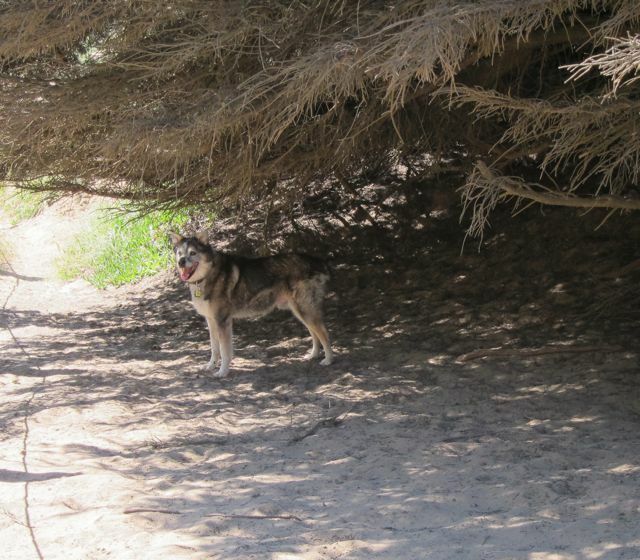 Did you know you could play a good game of hide-and-seek in the sand dunes? Another great beach sport, in case you didn’t know. Of course, I was waiting for a ball throw. What else????? 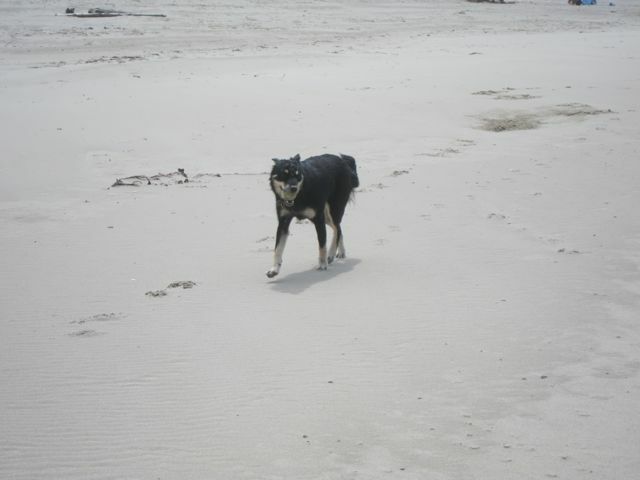 Toby and I took a bit of a stroll back up the beach. 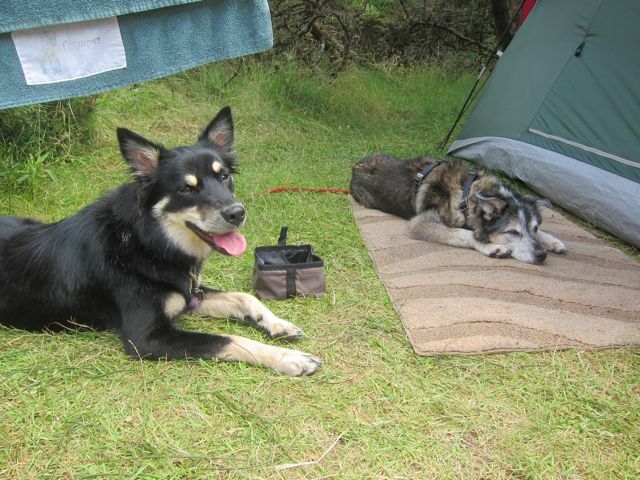 We were a bit tuckered out when we got back to their campsite. Mom, Dad & their friend roasted wieners over the fire. They even gave us some! Pretty good end to a fun day, if I do say so myself!! Toby here again. 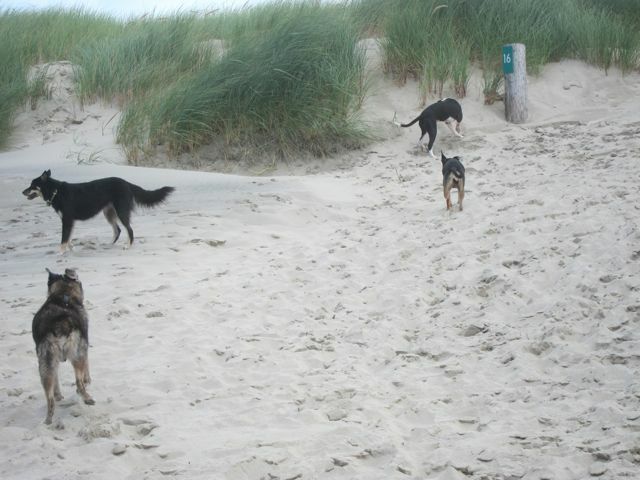 I’ve been thinking about the great beach trip we took on Friday and thought you’d like to see a few other things we saw at this dog park. 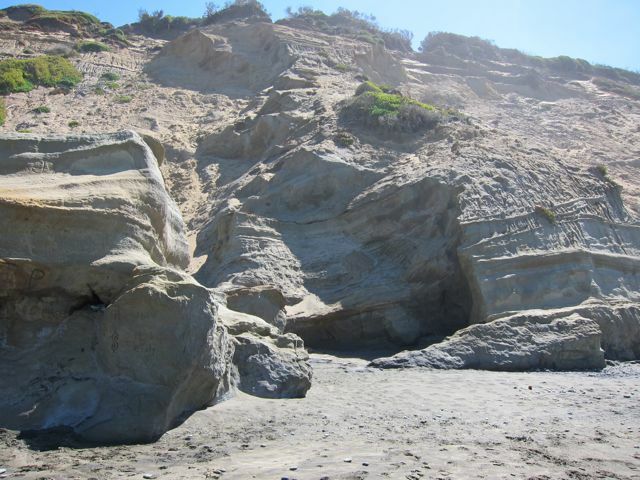 You saw yesterday how far down we had to go to get to the beach at Fort Funston. 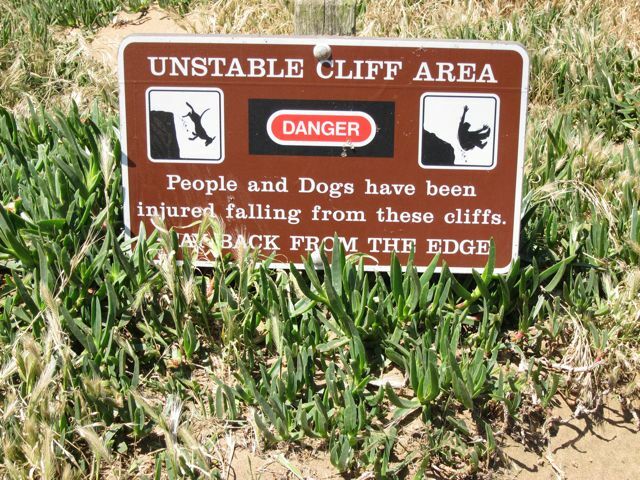 When Luna and I saw this sign, we decided this was not a good way to go…… There was a neat place in the cliff that might have been a cave. I wonder if pirates hung out here? This part of the cliff is no where’s near as high as where we came down! But we decided it was not the best place for a scramble up the rocks!! 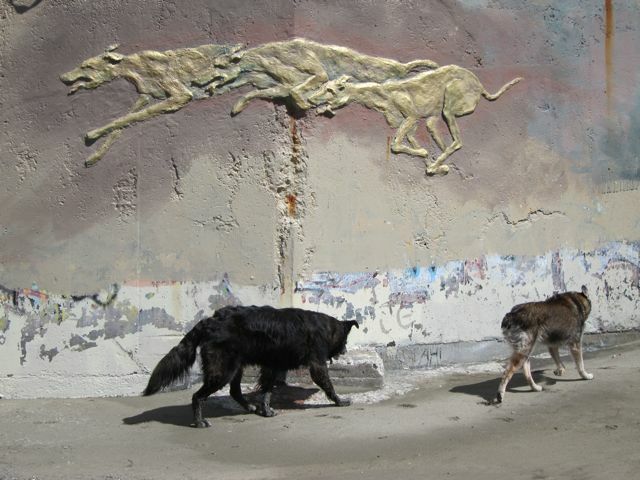 There was a memorial to greyhounds on the beach and reminded me of our many greyhound blog-buddies. Looks like they were zoomin’!! On the top, I caught a bit of shade before going back to the car. On the way, we heard this raucous noise. Mr. Crow was talking and talking. 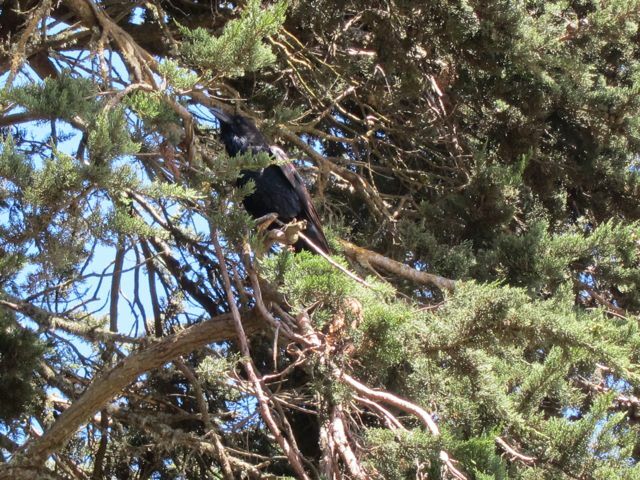 I wondered if this was the crow that was at our house a couple of months ago? Maybe he was telling me all about his travels south. Well, I could tell him a thing or two!! 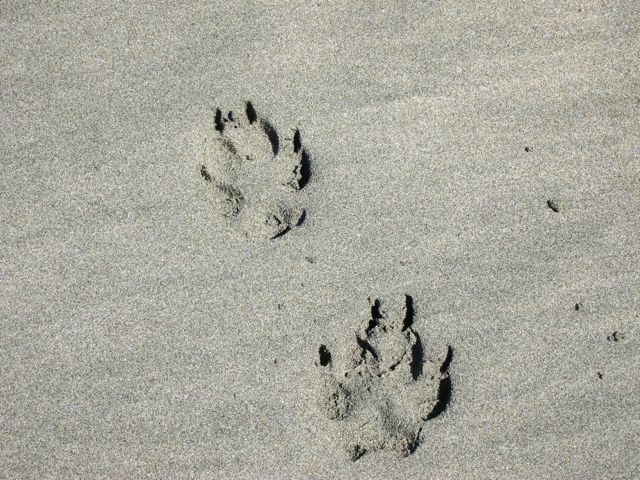 Luna and I wanted to leave you with these paw prints in the sand. We thought they were pretty special.